This is Part 3 of my RPGaDay Roundup, if you’re just jumping in. You can read Part 1 and Part 2 by clicking their links. I’m a huge fan of the Adventure Paths for Pathfinder in general. I think the concept of packaging a discreet section of a campaign, along with a mini-gazetteer and bestiary is brilliant. 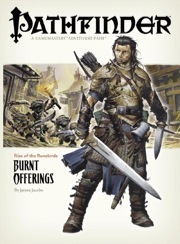 There have been many Adventure Paths published over the years, but my favourite is still the first one: Burnt Offerings, from the Rise of the Runelords AP. It has some of my favourite monsters, goblins, showcased in all their re-imagined and psychotic glory; it contains the village of Sandpoint, which is such a perfect starting locale for adventurers it’s like a gift to the GM; and at the time (and still, for the most part) no one else was publishing a book like it. Add in gorgeous and evocative cover art by Wayne Reynolds and there is nothing to dislike about this book. And as I mentioned before, Paizo has continued to improve upon the Adventure Path idea since. Games may come and go, but I can predict with some certainty that one form or another of Dungeons & Dragons and Pathfinder will still have a place on my shelf. D&D has been such a big part of my life, I’ll always have it around. And Pathfinder, though relatively recent, is such a huge part of my current gaming life. Not just the game itself, though that might be enough. No, the friends I’ve made playing the game and as a Venture-Captain for Organized Play, the experiences I’ve had because of the game…Pathfinder isn’t going anywhere. The Firefly RPG, hands down. I’m a huge fan of the Firefly show and universe, and this RPG from Margaret Weis Productions highlights everything I love. Action, adventure, clever dialogue (okay, that last depends on the players but something about the game manages to bring it out) all set in a ‘Verse I’ve come to know and love. There might be a time when flying my own ship crewed by a band of strangers and miscreants won’t appeal to me, but I don’t see that happening soon. I will say this, it is not a game for all players. If you are with a group who all love the Firefly show, which is arguably most of the time, you’ll have a lot of fun. But playing it with folks who are not familiar with, or just didn’t like, Firely, can be a bit of an ordeal if you are trying to immerse yourself. So choose your crew wisely. 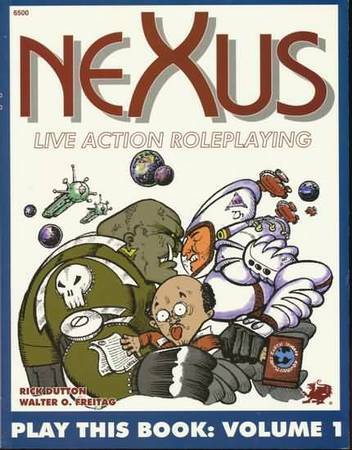 One of the best second-hand purchases I ever made was the Nexus Live Action Role-playing, Play This Book, Vol 1. I love game books which give me a view to what the earlier days of gaming were like. The book laid out a live-action role-playing game scenario, which could best be played as part of an existing sci-fi or gaming convention. Closer to the idea of those party game murder mysteries, participants would be given characters ahead of time. They would then costume themselves, use the prop items and clues included in their character package, and show up ready to play through the game all weekend. The book was great! Not only did it outline a pretty interesting plot which included competing intelligence agencies (terrestrial and non-), alien criminals, and a scientist from multiple dimensions, it also gave detailed instructions on how to organize and manage the game. Much of the information is dated, as it comes from a pre-internet and smart phone era. But reading it, I could easily see how aspects of game-play could be updated for use now. I don’t even know if they published a Vol 2. But I take the book off my shelf and re-read it often for a bit of nostalgia. 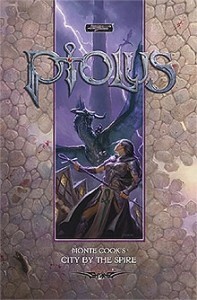 Published in 2006, Monte Cook’s Ptolus: City by the Spire is still one of the coolest looking gaming books I own. Now, if it was just a really well-detailed campaign source book from Monte Cook, that might be enough. But this book is so high quality, so unlike any other book published at the time (or since, really), it is the game book to which I compare other game books, and fine them wanting. It’s annotated. As a GM who has suffered much eye-strain over the years trying to search out details when I’d forgotten where I’d found them, that alone makes the book priceless. Added to that, it is such a beautiful book throughout, with more full-colour art and maps than I’ve seen in entire game systems, never mind a single book. I was lucky enough to get a print copy when it was first published (and later, to get it signed by Monte Cook himself). If there is a house fire, Ptolus will be in my arms as I leave the building. Pathinder is about as complicated as I get these days, and I tend to look at alternatives which are much lighter in complexity. I don’t mind complex, as long as it serves a purpose other than to be intentionally arcane. I came out of the era of THAC0 and Rolemaster, after all, so I am no stranger to convolutions in my gaming. If you get a chance to look at them, the wide variety of critical hit charts for the original Rolemaster game are a work of art. Talk about detail for the sake of detail. These tables listed the effects of a variety of different major wounds sustained from an endless variety of weapons, monsters, and other misfortunes. I don’t know anyone, myself included, who actually used them all. I remember my group in junior high had a brief flirtation with them, as applied to our AD&D campaign. But it was a brief fling, as we had better things to do than roll on tables all the time. This brings us up to date, gentle reader. Starting Monday, expect a new RPGaDay post every day as we finish out the month.